Primary purpose of this lecture is to presentation on Output Devices. This lecture briefly explain Computer Output Devices and main focus on computer monitors. 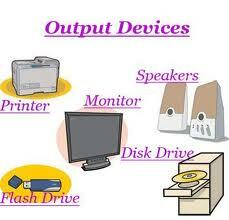 Here explain some output devices, they are: Monitor, Projector, Printer, Headphone, Speaker and Plotter. Finally analysis on Digital Monitor and Analog Monitor. Under Analog Monitor here focus on Flat Panel Display, Plasma Display and CRT monitor.